“It’s a violent place”, John said as I described the long walk Pam and I took on Wednesday. “I don’t like camping there,” he went on. The cliff walls are vertical and almost claustrophobic, yet the basin is open and exposed. Long silver threads of waterfalls dangle down the cliffs, filling the air with the sound of melting snow. Avalanche debris clogs every channel. It’s not a settled eroded sort of place, but recently formed by the forces of gravity and weather. Right now, the rough edges are softened by summer. The early morning marine clouds evaporated, letting the sun blare down upon lush meadow vegetation. We scouted ahead with crosscut saw and ax, making sure the trail was clear for Katie and the packstring. 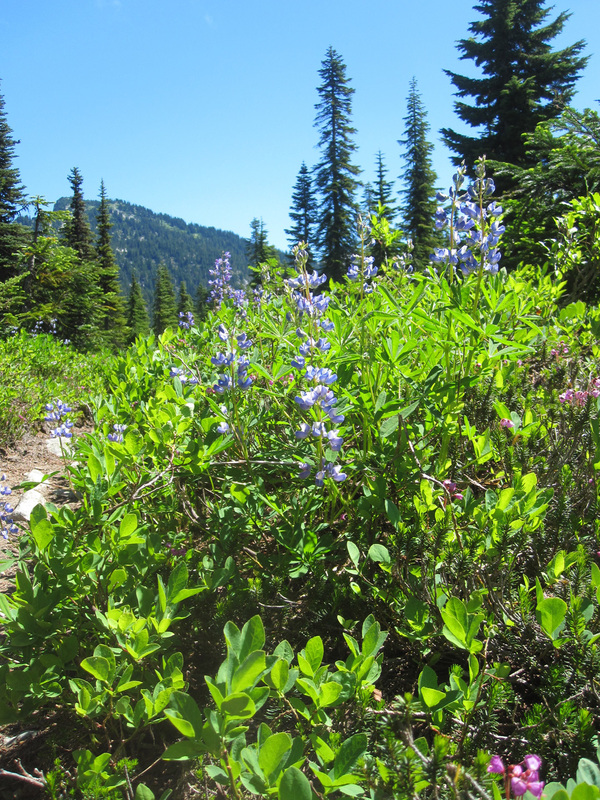 It’s impossible for me to choose one favorite mountain wildflower, but the combination of lupine and red heather is hard to beat. Warm air releases a wild floral scent, and I feel my steps grow a little lighter as I follow the scent trail. 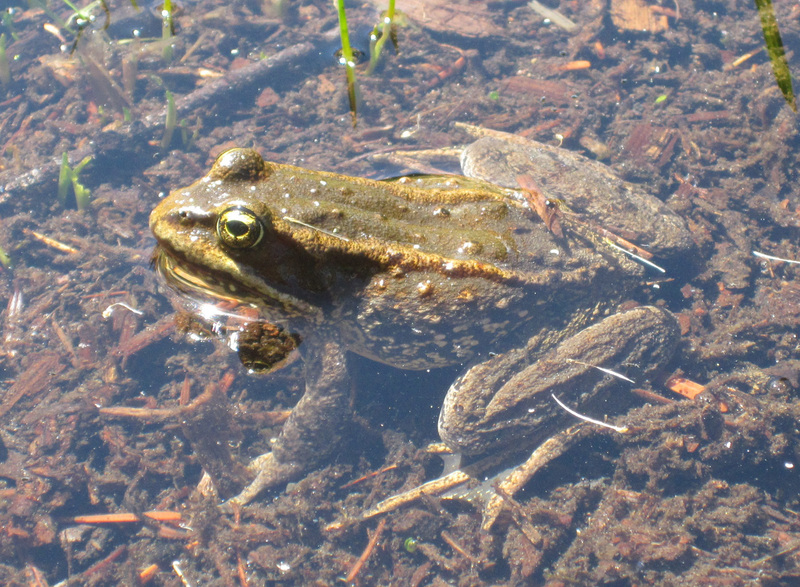 I’m also quite fond of frogs, and Cascades frogs of all sizes spurted into meadows and puddles as we clomped by. I have heard that global climate change may have a negative effect on frog populations, but so far I’ve not observed a decrease in our local frogs–they appear to be thriving. 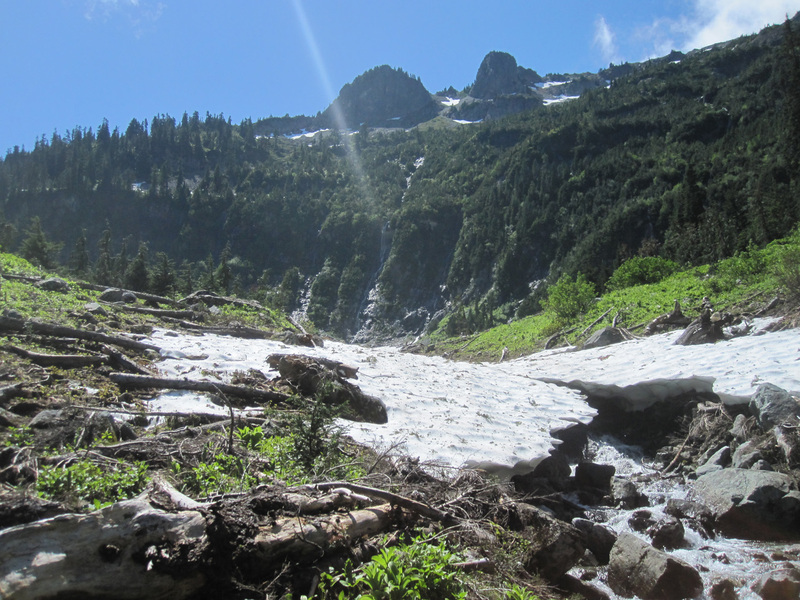 It’s unclear yet whether the big changes will make the Pacific Northwest wetter and warmer, but that would be better for amphibians than drier and warmer. For now, we still have frogs galore, and I am glad. On our return trip down the Deception Pass trail, I noticed this old marten set in a burned cedar snag. You don’t see these very often any more. In the early days of the twentieth century, trappers ran traplines to capture these intensely curious members of the weasel family. 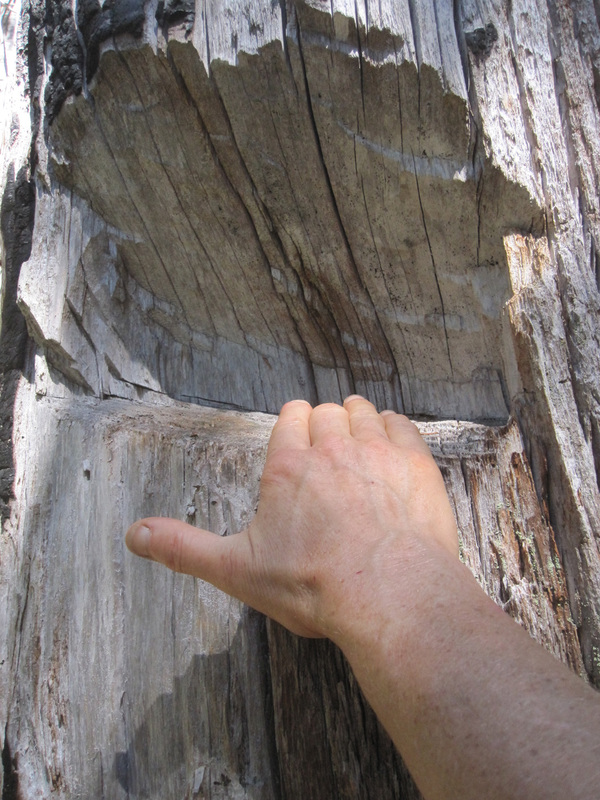 A shelf was chopped eye level in a tree, and this is where the trap was set and baited. Martens would not be able to resist temptation. Most of the trapping was done in winter when the fur was its plushiest. The furs were sold so that fashionable ladies could wear marten stoles over their shoulders–once in awhile you can find these in vintage clothing shops. I cannot imagine anyone wearing a skinned dead weasel these days. Marten hairs are also used to make sable paintbrushes, and most of sable now comes from Russia and Siberia. I’ve owned sable brushes in the past, but now use only watercolor brushes made of synthetic fibers. My few marten sightings in the woods have been so magical that I can’t bear to think of them harmed by humans. Marten sets are a relic of days gone by. The trip to Cliff Tree Basin and back was thirteen miles. We ended up cutting four logs, and crossing the Cascade crest. I always feel better when I get back on the east side of the mountains where I belong. A long day of hiking, and we were so happy to see our temporary home at the Fish Lake Guard Station. The evening cooled beautifully and we could sit on the porch without getting devoured by bugs. It’s much quieter than our first visit–the thrushes have gone silent, although I’m sure they’re still around. The side streams are drying up, so it was only the low rush of the Cle Elum River humming me to sleep at night. On Thursday, Katie showed up with three horses and five mules. Here’s Buck (“Mr. Attitude”) with his goofy shovel-festooned manty loads. He handles this with total aplomb, and nobody laughs at him. He gets the job done. When everybody was loaded, the crew clip-clopped up the trail and I waved goodbye and good luck. 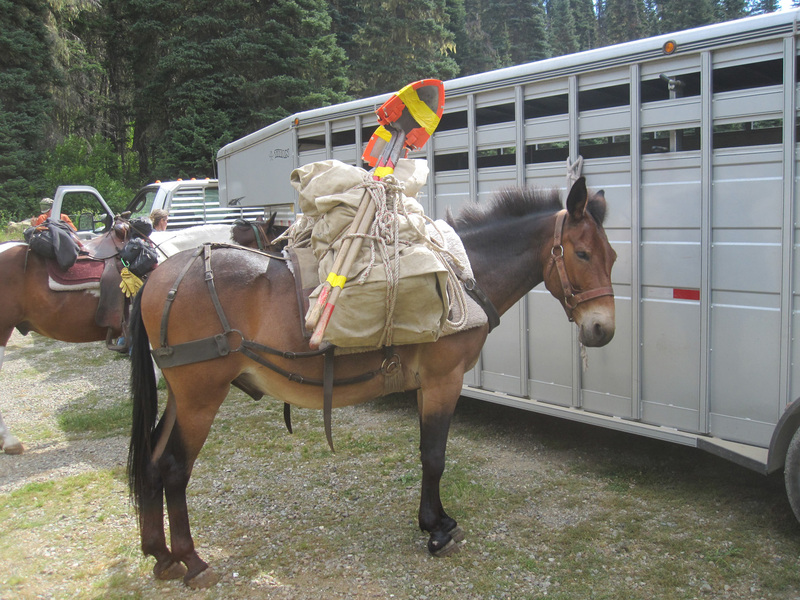 They went back to Cliff Tree Basin to drop food and tools for a youth crew who will be doing trail work next week. That’s a good thing–kids in the mountains working hard, learning and growing. Maybe one or two of them will join the next generation of trail crew dirt people. Cliff Tree Basin? I have not heard of this place. Where is it?